With the United Kingdom's successful prosecution of noted radical Islamic preacher Anjem Choudary for providing material support to ISIS, British officials are now faced with the dilemma of what to with him when he is sentenced Sept. 6. While he is sure to receive a lengthy period of incarceration, that may create even more problems for counter terrorism officials. In going to prison, he is not actually moving from the frying pan to the fire. A more appropriate analogy is akin to the fox in the hen house. Anjem Choudary has spent the better part of 20 years preaching, proselytizing, and recruiting individuals to a radical form of Islam that encourages jihad as a necessary tenet of the faith. He has done it on street corners, mosques, and in front of television cameras. And like a sly fox, he avoided prosecution in the past because no direct contact between him and a terrorist organization could be proven until now. British authorities uncovered a video of Choudary pledging allegiance to ISIS leader Abu Bakr al Baghdadi. 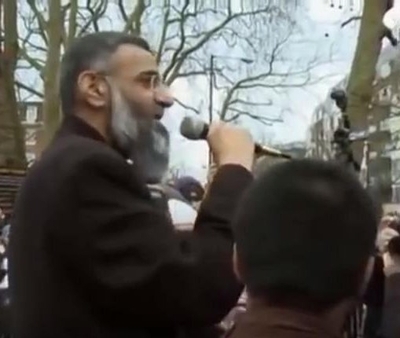 When he goes into prison, Choudary will have the opportunity to continue his evil work in an environment that guarantees him a captive audience of people who already have a disdain for government and a predisposition for violence. It is fertile soil. How successful will he be? We already know of his effectiveness with ex-cons such as shoe bomber Richard Reid, who attended the Finsbury Mosque after his release from prison. Finsbury was one of the places that Choudary was allowed to preach his message of hatred and intolerance to all things non-Muslim. Many of his converts are already in prison for committing terrorist acts. One of them is Michael Adebolajo, convicted in the brutal murder of 25-year-old Lee Rigby, a Fusilier in the British Army as he was returning to barracks. Since his incarceration, prison officials have had to transfer Adebolajo from the general prison population in Belmarsh because of his attempts to influence and radicalize other inmates. Another Choudary protégé, Richard Dart, was sentenced to six years in prison in 2013 for his part in a plot to bomb a memorial service for British soldiers at Royal Wooten Basset. Also in prison is Junead Khan, convicted last spring for conspiring to kill U.S. servicemen stationed at the RAF Lakenheath Base. Authorities believe Khan was radicalized by Choudary and inspired to act in similar fashion as the Lee Rigby killing. Prison walls are porous and it is virtually impossible to completely isolate one inmate from others. It remains to be seen whether Choudary will have direct contact or will communicate through kited letters or other illicit prison communication methods. But he will continue to get the radical Islamic message out unless authorities stay one step ahead of him. The effects of Islamic radicalization in the prison system have been well documented both in the United States and Europe. The threat has been acknowledged by counter terrorism officials around the globe, although effective ways to combat it have not been clearly defined. We know that one catalyst in the radicalization process is the presence of unvetted Islamic clergy in prison mosques. We have also seen what can happen when a convicted Islamic terrorist is allowed to work in the chaplain's office or the prison mosque as in the case of El Sayyid Nosair, who was the chaplain's clerk in Attica State prison when he plotted with others to bomb the World Trade Center and other New York City landmarks in 1993. This poses serious questions as to what Choudary will be allowed to do while incarcerated. Will he be allowed to attend religious services, or be allowed to participate in congregational prayer with other Muslim inmates? Before you think that could never happen, we should remember the case of convicted Islamic terrorist John Walker Lindh. Lindh was captured in Afghanistan in 2001 fighting against the United States alongside members of al-Qaida and the Taliban. He was sentenced to 20 years in prison under special administrative measures, including solitary confinement, for his treasonous crimes. He sued the U.S. Bureau of Prisons in 2010 for the right to gather openly five times a day with other Muslim inmates in the maximum security prison at Terre Haute, Ind. In 2013, U.S. District Court Judge Jane Magnus-Stinson ruled in his favor. Another question surrounding Choudary's sentence involves rehabilitation. What efforts should be afforded to inmates prior to their release to lower the risk of recidivism? Does the U.K. have an effective or successful de-radicalization program designed specifically to address Islamic radicalization? Recent attacks in Paris and Brussels by radicalized ex-cons show whatever officials have now isn't working. We know that the United States does not have any program aimed at de-radicalizing inmates. Our latest endeavor in dealing with incarcerated Islamic terrorists has been to send 15 of them from Guantanamo Bay to the United Arab Emirates. Hopefully the United Kingdom would not seriously consider sending Anjem Choudary to such a country for any type of alternative to prison supervision. Sadly it seems that what will probably happen is that another fox will be let loose in the hen house. And nobody wins with that except the fox. For 20 some years the British have been trying to get this guy out of their country and he stands right on their streets and laughs at them now this is the best they can do - really !!!!! This is so pathic that a government can t get their head around on how to do get rid of this scum. like among aged men who can't do anything and are not getting out anytime soon. Hard labor would be another good one. Breaking up rocks all day is healthy. The presence of radical Islamic clergy and its effect on the prison population had been cited in two investigative reports. The first by the Department of Justice's Inspector General in 2004. The second by the FBI's Counter Terrorism Division in 2006. Both are public records. If they are hell bend on destructing our western society why do we give them the time of day,or indeed the light of day? The best thing for thugs of his ilk is to be destroyed and quietly forgotten about. Plenty of our young soldiers are scarred for live by what they see that these animals do to their own kind, let alone what is in store for us if they would ever get the upper hand. It is time we stand up to all the do-gooders and bleeding hearts and get rid of scum like him, he has no rights, as they believe we do not in our own countries!! "We know that one catalyst in the radicalisation process is the presence of unvetted Islamic clergy in prison mosques." Sorry to be in your face, Mr Dunleavy, but you are talking nonsense. What you are describing is relationships between fellow extremists. This is not an underlying cause of extremist behaviour. The relationships they form are to support one another's acting out, but their acting out is driven by pathologies developed much earlier. You need to understand how extreme behaviour is driven by childhood experience of cruelty, brutality, confinement and corporal punishment/physical assault which lead to emotional repression and dissociation in the adult. You need to think differently about the underlying causes of extreme behaviour, Mr Dunleavy, if you are to successfully treat it. You are focused on policing ideation and all that gets you is more ideation. To counter extremism you need to include understaning the relationship between childhood conditioning and emotional repression. Secondly, you need to use your understanding to develop a practical challenge to these unconscious emotional drivers. Without an emotional understanding your actions are nonsensical and utterly ineffective in creating change in pathologised individuals who associate by shared but unconscious rage, shame, despair and terror.